The Immune System: Genes Receptors, Signals provides information pertinent to the complexity of immune mechanisms. 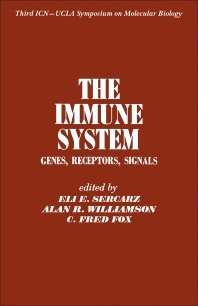 This book describes the immune response genes and products, which point to another multigene system controlling immune responsiveness. Organized into 37 chapters, this book begins with an overview of the details of antibody structure that continue to be of importance to an understanding of the regulation of the immune reactions. This text then examines the evidence that individual antibody species are capable of binding many structurally dissimilar haptens. Other chapters consider the conceptual framework generally accepted by immunologists, which states that antibodies are specific for the antigen used to elicit the immune response. This book discusses as well the mechanism underlying the biosynthesis of antibody binding sites, which is unprecedented in its adaptability. The final chapter deals with the genetic controls of specific immune responses. This book is a valuable resource for immunologists and research workers. T Cell Regulation: The "Second Law of Thymodynamics"
Idiotypic Receptors for Alloantigen on T Cells?